US chemists have discovered a new way to break the bond between carbon and fluorine atoms - the strongest carbon bond there is. The reaction, which is mediated by an iridium complex and proceeds in an unexpected way, is important because many pharmaceuticals and agrichemicals incorporate C-F bonds. The research suggests possible routes for the development of new catalysts to promote reactions that make or break C-F bonds. 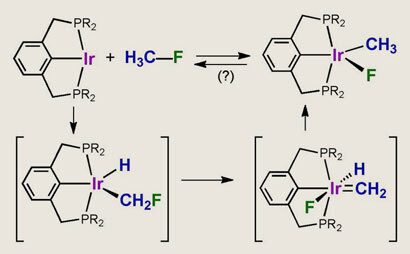 Bonds between fluorine and carbon atoms in aromatic rings or with double-bonds can be made and broken by using oxidative addition mediated by transition metals. But this approach has failed with the kinetically less reactive bond between fluorine and alkyl carbon atoms. 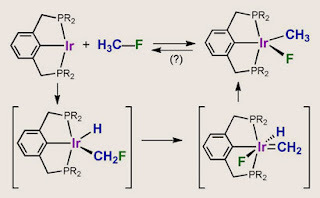 Now, researchers at Rutgers University in New Jersey have cracked the problem by using a catalyst based on an iridium centre clamped between two bulky dialkylphosphino groups - a so-called pincer-ligated complex.